Neil Lennon has put his Scottish Premier League manager of the month award down to unity between Celtic's players, staff and supporters. 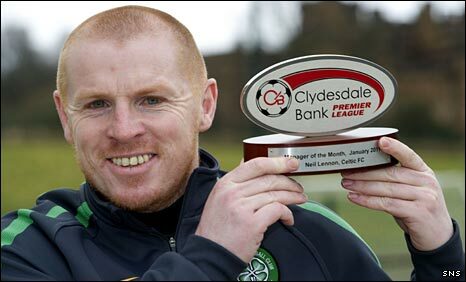 Lennon received his Clydesdale Bank award after Celtic secured four wins and a draw during January. "It is a testament to how well the players have done," said the manager. "And there is great unity among the club at the minute. Not just between the players and the staff but the supporters as well." The SPL leaders began the month with a 2-0 victory over Old Firm rivals Rangers at Ibrox. Lennon's side followed up a draw with Hamilton Accies with wins over Hibernian, Aberdeen and Hearts. Celtic now enjoy a five-point lead over Rangers at the top of the table, having played two games more, and are unbeaten since losing to Hearts in November. And Lennon thought the return to fitness of Gary Hooper and Beram Kayal had been particularly significant. "We have just found a vein of form - I think Hooper coming back, and Kayal, and people are hitting top form at the right time for us," he said. "There is a confidence running through the team and it is not a misplaced confidence either. They are working very hard off the ball." Celtic remain in the Scottish Cup, in which they meet Rangers in a replay, and also face their city rivals in the Co-operative Insurance Cup final. "It is satisfying, but we have won nothing yet," said Lennon, whose side remain in the running for the domestic treble. "We are not getting carried away with ourselves. "We are very pleased with the progress we have made. We have a tough month ahead of us now and big games coming up, so we are going to need all our players and all our squad." With that in mind, Lennon was nervous about any injuries that might be picked up during this week's international fixtures. "Ki's just come back from the Asian Cup and had to go away again, which I find ridiculous," he said. "But some of the players want to go, which is fine. I wouldn't stand in their way from playing for their country, but it is just the timing and the fact they are not qualifying games either. "From my point of view, it is a wee bit tense this week and I hope they come back in decent shape." Celtic have five players involved in Wednesday's Nations Cup match between Scotland and Northern Ireland. "I think it will be a decent game," said Lennon. "Home internationals were great back in the day and I think it's not a bad tournament, but it's just the timing of it at this stage of the season that's a bit off."